We had every intention of being homebodies this year. No travel at all, just a year to save our pennies and get grounded. It’s been delicious. After several months of staying in our little coastal home, my mind is sharper, my sleep schedule is approaching normal, and I’ve got a good start on my next book. Then, something just as wonderful happened. The publishers of Sapphire Books invited us to be part of “Literary Adventures at Sea,” a program they put together with Olivia Cruises, which is being sponsored by Curve Magazine. I admit that I cried when we were asked. Two of our best friends urged us to join them. My sweetheart and I never ever dreamed we could go on a cruise. This one is sailing the inland passage of Alaska. Alaska! Growing up my parents’ apartment in Queens, I never thought I’d travel farther than Manhattan. The Staten Island Ferry this ain’t. 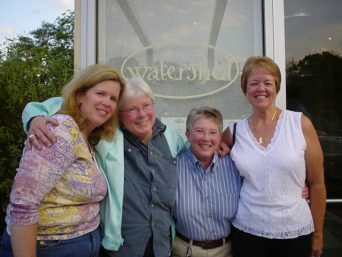 We’re celebrating our tenth anniversary in style—and with a cozy group of over 1,800 lesbians. As of a week ago, there were all of three cabins available. Even when I did go into Manhattan, the lesbian bars held no more than perhaps a hundred dykes? This is a floating women’s festival. This was the cruise that writer Cate Culpepper gave herself before she died, sans a boatload of lesbians. I expect to meet her spirit along the way, beaming at all the women, women, women! I have visions of serenity, of calmly sailing wide blue waters, of passing glaciers of profound clarity and immensity, and perhaps a glimpse of northern lights to take our breath away after a long, long day of sunshine spent with my beloved on this, our tenth perfect year together. The months leading up to this voyage have kept my sweetheart as busy as I’ve ever seen her. In what she calls her demented excitement about our cruise, she has already looked at 700 online pictures of where we are going. She has mapped out every deck on the boat. She has examined seventy possible off-ship excursions and has chosen the five best that suit us both. She’s even inspired and written half of this column. All this in the evenings while I read my escapist books and try to ignore the impending departure from our home, which I find extremely difficult, and from our cat, whose diabetes worsens with stress, especially when we are away. Our cat Bolo considers “away” to be any time I’m not next to her writing a new book for my publisher, Bold Strokes Books, while she bats things off the side table. So concerned is she that we’ll disappear, that she follows me into the bathroom while I take a shower, eager to remind me that whenever I want to feed her is okay, as long as it’s now. Leaving her in the care of our truly devoted cat sitter for even one night is not readily forgiven upon our return. My sweetheart usually spends two or three hours packing on the day of travel, while I fret, eyes glued to my watch. This time, a month before we set sail, she is already half packed and has written out the cat sitter’s check. Still she pours over maps of every location, wallowing in joyful anticipation. She has created an hourly itinerary Excel spreadsheet for each of the eight days we will be away. All I have to do is play that age-old game, Follow-the-Femme, though I know there will be hours blocked out to accommodate my visions of a week communing with the natural world and Cate Culpepper. I’ve never lived with an overexcited little kid, but that seems to be who I fell for in June, 2007. She claims that I’ve recently given up hope of reading more than a chapter of any book without at least one peep from her that goes something like, “Can I just tell you this one thing about Sitka/ Ketchikan/Juneau/Victoria?” Or: our room, our view, boarding, disembarking, Suzanne Westenhoefer’s show, dancing, and where we’re going to have lunch on our drive home. Such a woman deserves a bank-breaking anniversary, even if she’s been working overtime so we can afford it. The bathroom is stuffed with her luggage. The futon is covered with my suitcase and essentials and the cat’s been sleeping on everything, in a vain plea for us not to leave her for a whole week. A week is forever to little Bolo, and forever is what my sweetheart and I have pledged to each other. It’s been an incredible ten years since we met. I could not have found a more unconditionally loving, funny, caring, understanding, helpful, lovely, intelligent, alluring, forgiving, patient, or fun wife if I’d been looking. Which I wasn’t. Silly me. Posted August 30th, 2017 & filed under Blogs.